I finished making my Awning today and here it is! Quite happy for $50! The figure 8 clip on one end keeps coming off , but we'll fix it somehow. Love this bus and you just keep making ot better. Just checking out the awnings. Really like your set up. Nice. 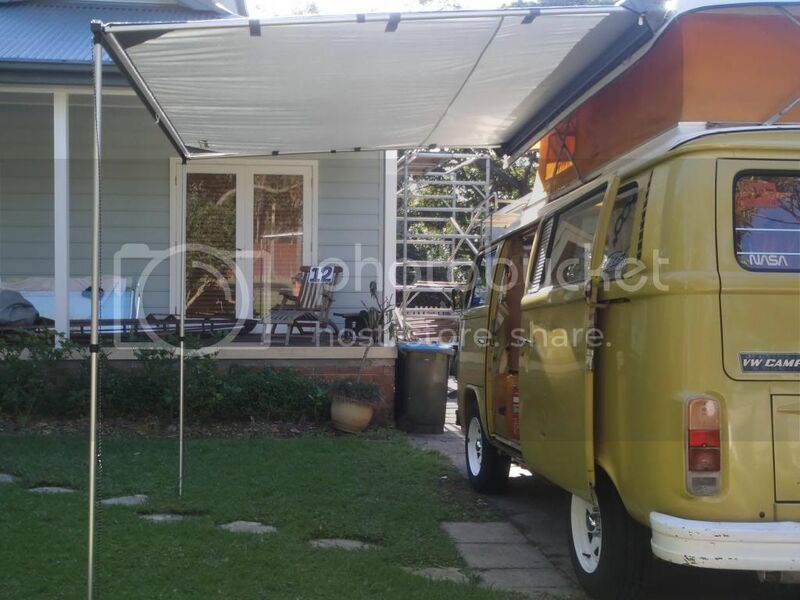 How does the awning attach to the kombi pop top, is it permenant or can it be removed when you are home. Yea thx its a mates setup he has his on permenant . We picked this one up for $250. Best purchase we've made in a long time. It slides onto the kombi but is easily detached for driving away. We sometimes separate the annexe from the van and put a tarp in between. Makes an ideal bedroom for the daughter and plenty of room under the awning for a kitchen. Thanks again Les. We have been using it almost every weekend. 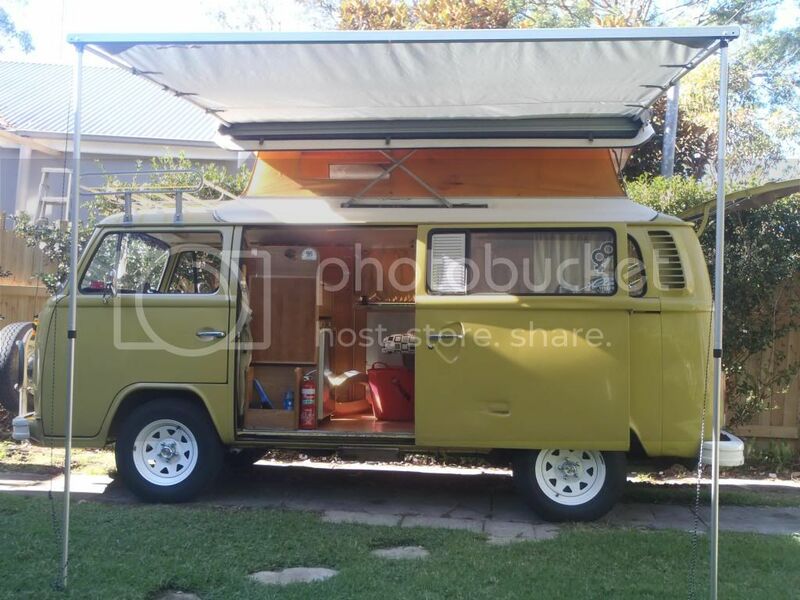 Do you think we should put it up at the kombi fest and are you going to be there this year? 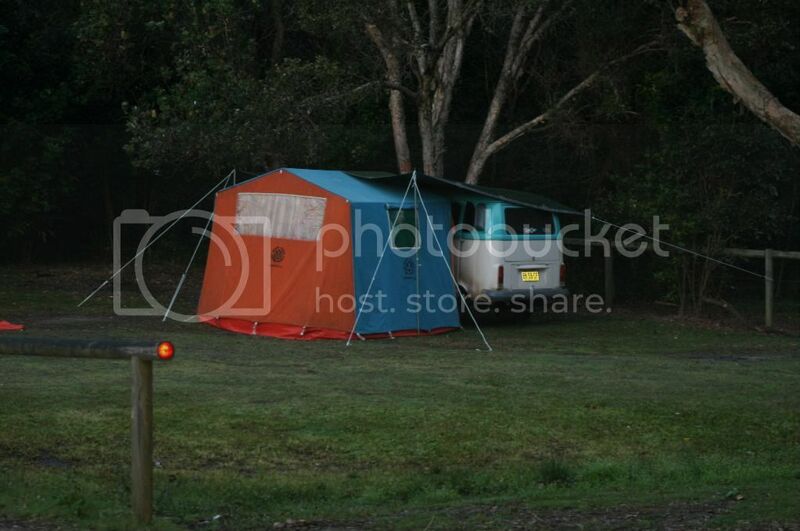 Outwell Coastal Road tent, Has anyone got one ??? We are looking at buying a tent for the side if Milly, I have noticed Justkampers has a Bundle kit of the Big Coastal road tent for $854.00 that comes with an inner tent and padded flooring, has anyone purchased one of these set ups ? if so how do you rate it ? and what are its pro's and con's ? I've just had an awning made and thought it would be of value to someone. I very much struggled to find something that was suited to the car and didn't result in it looking bog when not in use. 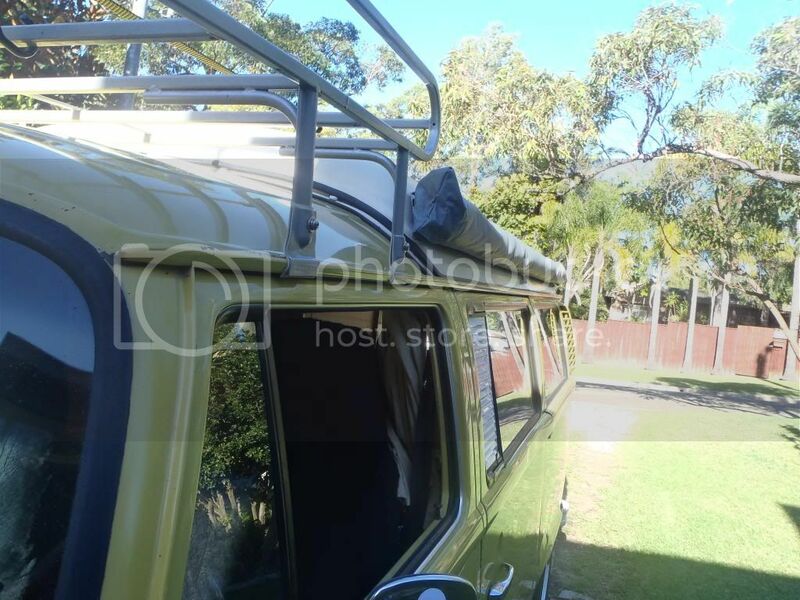 I settled on a kombi awning by Platinum Trimming on the Gold Coast for about $800. It is supported at the jacking point and engine mount and takes about 10 minutes to casually put up and pull down. When down, I store the awning canvas behind the drivers seat in front of the bulkhead and the pole bag behind the seat (snugged in the 100mm gap between the seat back and the rock and roll matress over the engine) so lose no proper usable space. Also, fixed with a sail track rivetted under the pop top so nothing at all visible when the pop is down and the awning is not in use. Not for everyone as it's still not as simple as a roll away awning permanently mounted to the side of the van. Also, not too cheap either. But I like supporting the smaller operators, and for me, I'm happier with something that doesn't compromise the look of the car. Very nice, like the way the poles are out of the way. Is there provision for ropes to hold it if there is strong wind. Would love some shots of the frame work only with no canvas attached. Yeah, two pegs with guy ropes provided for when breezy. Ill try to get more pis at some stage. 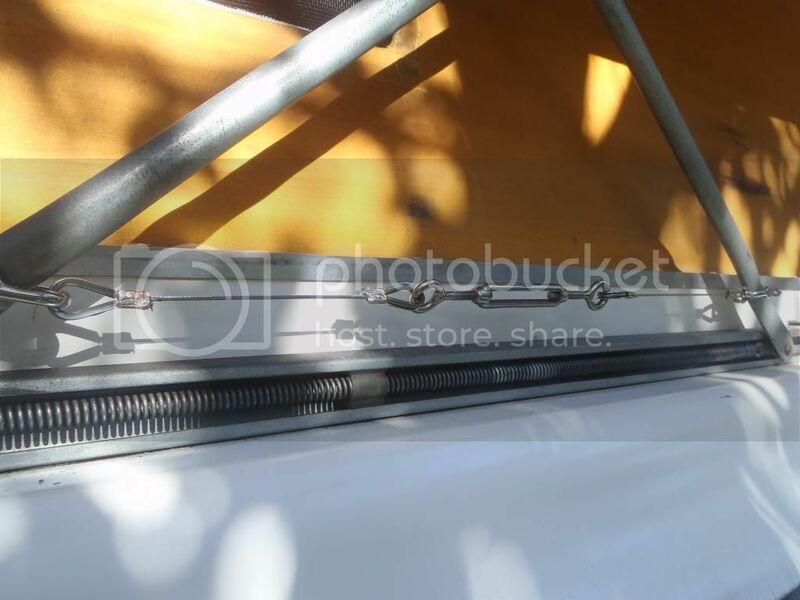 Can't show frame without canvas on as the frames hang off the canvas at the side of the car. Difficult to explain without seeing it. Pretty elegant design though. I'm really impressed with the quality & build of this awning. I was going to remove it for day to day travel but it so neat & compact I think I'll leave it on. I mounted it on some 3mm thick white, nitrile rubber to cushion against the fibreglass with 4 sets of 2 bolts along the length of the track. Oztrail supply 4 bolts & 2 roof rack brackets with the unit, however I mounted it direct to the canopy & wanted additional support. Comes with all guys & pegs required to hold it secure when windy too. 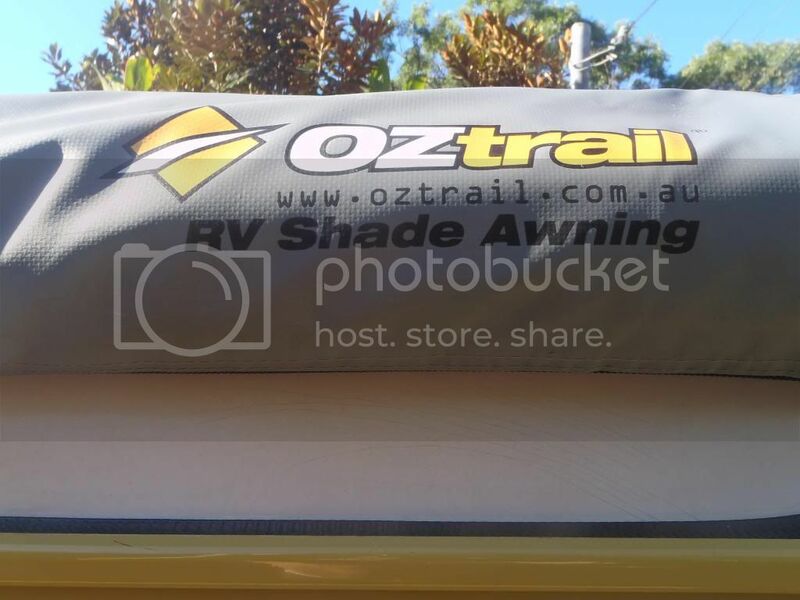 These awnings are great for a weekend getaway when you don't really need to set up a tent for a longer stay......easily covers 2 x chairs, a table with plenty of room all 'round. Having the additional head room is great as you don't have to duck under the edge of a canvas or like. All the poles etc. are telescopic, cam-lock set up so you don't have to put anything together....just unzip the cover, unfurl the awning, drop the poles - horizontal & vertical, lock'em off & that's it. About 5 min from start to finish. I just bought one of these, have you got anymore feedback? Jk has a clearance sale on the outwell mountain road tent with inside sleeping tent for $350 with free postage....thats more than 50% 0ff as it was over $700 for the same thing. Didnt see this come up again till now. I find them great - huge inside - enough room for 1 daughter in a stretcher bed, camp kitchen bags, toys and plenty of other crap and has a really good door system on the sides with flyscreens and a hood over the door (which you hit your head on each time - but I have a hard head so I wasnt worried (wife complained a lot about messing her hair up). The tent is easy to set up and can be done by one person - preferably not on a windy day yet possible. The floor zips in making it easy to clean - just unzip a part of the floor and sweep out then zip up again. Handled a fairly heavy overnight storm well on the Gold Coast Bus Stop this year without leaks - we were in the flood zone too. (I was worried about the flood zone - not the tent so we put both daughters in the van that night. But no water came in. Oldman...great pic's...I was considering fitting an awning to a roof rack but I will look at directly fitting awning to poptop now.